Copyright: © 2014 Suzuki Y. This is an open-access article distributed under the terms of the Creative Commons Attribution License, which permits unrestricted use, distribution, and reproduction in any medium, provided the original author and source are credited. In this paper, we report on the synthesis of BaTiO3 nanowires via the anodic aluminum oxide template method. To fill in the precursors of BaTiO3 into anodic aluminum oxide templates, the vacuum and drop loading method developed in our previous study was used. Ba(CH3COO)2 (barium acetate) and C12H28O4Ti (tetraisopropyl orthotitanate) were used as Ba and Ti sources, respectively. Anodic aluminum oxide membranes with the through-hole diameter of ~200 nm were used as the template for BaTiO3 nanowires. The sample calcined at 700 ˚C for 2 h with NaOH post treatment at 40 ˚C for 72 h to remove the anodic aluminum oxide was substantially composed of BaTiO3. Preliminary results on dielectric measurements were also discussed. In recent years, miniaturization of sensors, actuators, capacitors and micro-electro-mechanical systems makes rapid progress. In order to realize the further miniaturization, nanostructured piezoelectric ceramics have been intensively studied. By controlling their nanostructures, one can make them to exhibit phase transition behavior and dielectric constants different from those of the bulk, partially due to the particle size effect [1-4]. To date, besides equiaxed nanoparticles and nanoceramics, one-dimensional (1-D) ferroelectric and piezoelectric nanomaterials are of great concern [5-9]. 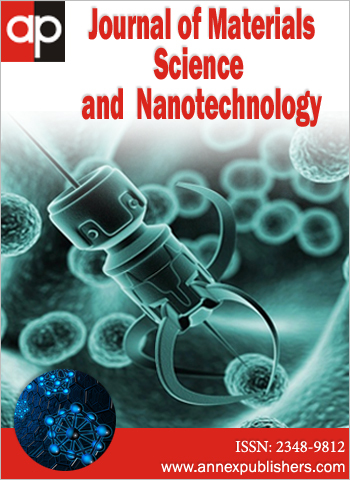 A variety of methods have been reported to synthesize 1-D nanomaterials. For oxide-based nanomaterials, three methods are typically used, viz., (1) hydrothermal method (using anisotropic crystal growth) [10,11], (2) anodic oxidation method (from metal precursors)  and (3) anodic aluminum oxide (AAO) template method [13-16]. The AAO-template method is a synthesis process in which AAO film with uniform 1-D pore channels is used as a template for 1-D nanostructure [17,18]. Due to its versatile applicability, we have focused on the AAO template method to prepare TiO2 nanorods and nanowires . Just by changing the hole diameter and thickness of AAO (or penetration depth into AAO), size and aspect ratio of 1-D nanomaterials can be easily controlled. In addition, 2-D arrays of 1-D nanomaterials can be synthesized through the appropriate removal of the AAO template. After the Restriction of Hazardous Substances Directive by the European Union in 2003, development of lead free piezoelectric materials has been actively conducted. Despite its relatively low Curie temperature, BaTiO3 is one of the potential candidates as lead free piezoelectric materials in some specific applications [19,20]. Hence, in this paper, we report the synthesis of BaTiO3 nanowires via the AAO template method. To fill in the precursors of BaTiO3 into AAO templates, the vacuum-and-drop loading method (VDLM) developed in our previous study was used . Ba(CH3COO)2 (barium acetate, 99.8%, Lot No. WEF3058, Wako Pure Chemical Ind. Ltd., Osaka Japan) and C12H28O4Ti (tetraisopropyl orthotitanate, TTIP, Lot No. T88NH, Tokyo Chemical Ind. Co. Ltd., Tokyo, Japan) were used as Ba and Ti sources, respectively. CH3COOH (acetic acid, 99.9%, Lot. No. TLE2561, Wako Pure Chemical) and C5H8O2 (acetylacetone, ACA, 99.9%, Lot No. TLN0469, Wako Pure Chemical) were used as solvent and chelating agent, respectively. The addition of ACA is effective to slow down the hydrolysis reaction of TTIP [6,16]. For the following sample preparation procedure, Ba(CH3COO)2: TTIP : ACA = 1:1:1 in molar ratio, and (Ba(CH3COO)2 + TTIP) : (CH3COOH + ACA) = 1:4 in volume ratio were used. At first, Ba(CH3COO)2 was put into a beaker and then CH3COOH was poured to it. The Ba(CH3COO)2-CH3COOH solution was stirred with a magnetic stirrer for 90 min. TTIP and ACA were drop wisely added to the Ba source solution, resulting into a yellowish solution. The solution was further stirred for 30 min. AAO membranes (Anodisc13, Whatman) are used as the template for BaTiO3 nanowires. The macroscopic diameter and thickness of AAO were 13mm and 60mm and the through-hole diameter was ~200 nm. AAO was dried at 100 °C for 1 h to remove adsorbed water. To fill in the precursors of BaTiO3 into AAO templates, the VDLM was used (Figure 1) . In short, the AAO template was put on the filtering flask as a cover plate. The precursor solution was dropped on the AAO plate for 1 min, followed by vacuuming for 30 s from the bottom part of AAO template. This procedure was repeated for 3 times. After inserting the precursor solution, AAO membranes was left in the air for 30 min to let precursor solution (i.e. TTIP in it) hydrolyze. Then, the samples were calcined at either 600, 700, 800 or 900 °C for 2 h in air. 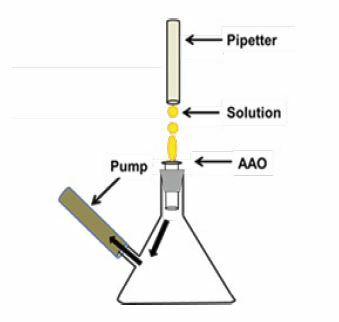 In order to remove the AAO template, the samples after calcination were put in a centrifuge tube filled with 1 M NaOH aq., and they were mildly heat treated at 40 °C for 72 h. After the NaOH treatment, samples were separated into solid phase (nanowires) and liquid phase by centrifugation (10000 rpm). Crystal structure of samples was identified by X-ray diffraction (XRD, 40 kV, 40 mA, Multiflex Rigaku, Tokyo, Japan). A reflection free Si sample holder was used for the XRD measurement. The microstructure of nanowires was observed by scanning electron microscopy (SEM, JSM-6500F, JEOL, Tokyo, Japan). Au was coated for SEM analysis to avoid charging, typically ~5 nm in thickness. Energy dispersive X-ray spectrometry (EDS) was used for the elemental analysis. Figures 2(a) and 2(b) show XRD patterns for the samples calcined at 600-900 °C before and after the NaOH treatment, respectively. Without the NaOH treatment (Figure 2(a)), XRD peaks from BaTiO<3 were confirmed for the samples calcined at 700-900 °C. 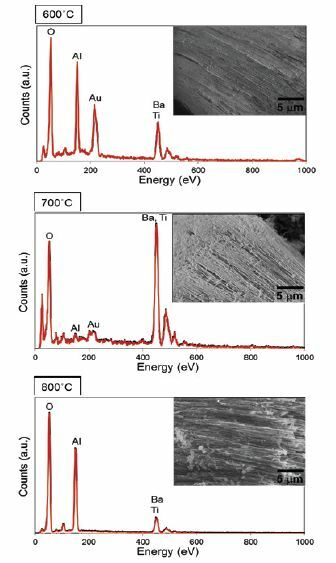 In addition, amorphous peaks from the AAO template were found for the samples calcined at 600-800 °C, whereas crystalline Al2O3 peaks were obtained for the sample at 900 °C. With the NaOH treatment (Figure 2(b)), XRD peaks from BaTiO3 were confirmed for all samples. Instead of amorphous peaks from the AAO template, some Al(OH)3 peaks were found for the samples calcined at 600-800 °C. For the sample at 900 °C, crystalline Al2O3 peaks remained. These results strongly suggest that the amorphous AAO template can be dissolved by the NaOH treatment (at 40 °C for 72 h), however, some remnant Al3+ ions (originated from the AAO template) tend to convert into Al(OH)3, particularly observed for the 600 °C and 800 °C samples. The formation of Al(OH)3 can be deduced as follows. During the NaOH aq. treatment, AAO templates (viz., amorphous Al2O3) reacted with NaOH aq. to form Na[Al(OH)4] complex. Even after washing with water and ethanol, some Na[Al(OH)4] remained on/within the samples. Then, it decomposed into Al(OH)3 by the reaction with atmospheric CO2. The XRD patterns indicate that the formed BaTiO3, before and after the NaOH treatment, seems to be composed of cubic phase (or pseudocubic). However, it is not so clear due to the limited quantity of the samples. The XRD pattern for the sample calcined at 600 °C followed by the NaOH treatment (the bottom pattern of Figure 2(b)) demonstrated that the calcination at 600 °C for 2 h was insufficient to obtain well-crystallized BaTiO3. Figure 3 shows SEM images of the samples calcined at 600-900 ˚C with NaOH post-treatment. For the 600 °C, 700 °C and 800 °C samples, aggregated bundles of BaTiO3 nanowires were observed. The diameter of each nanowire was ~200 nm, in good agreement with the hole diameter of AAO template. Breakage of nanowires is attributable to insufficient filling of the precursor liquid and the shrinkage during the calcination process. For the 900 °C sample, amorphous AAO template converted into crystalline Al2O3 as shown in Figure 2, which could not be removed by the NaOH post-treatment. Thus, crystalized templates (with BaTiO3) keeping the initial layer-like structure were observed. Figure 4 shows the results of EDS analysis for the samples calcined at 600-800 ˚C with NaOH post-treatment at 40 ˚C for 72 h. In good agreement with XRD results, the 600 °C and 800 °C samples contained relatively large Al peaks, whereas the 700 °C sample was substantially composed of BaTiO3. These structures may exhibit distinct properties from bulk due to their small size and large surface to volume ratio. Dielectric permittivity (εr) and loss tangent (tanδ) as a function of frequency at room temperature for the sample calcined at 800 ˚C are shown in Figure 5. Difficulties of device fabrication do not allow us to measure 700 °C sample with pure BaTiO3 phase. In the 800 ˚C sample, the dielectric response includes some contributions from Al(OH)3 impurity and the data should thus be viewed with some caution. Nevertheless, the 800 ˚C sample showed a stable dielectric response (εr > 800) over a wide frequency region, which was almost comparable with well controlled commercial BaTiO3 nanoparticles. 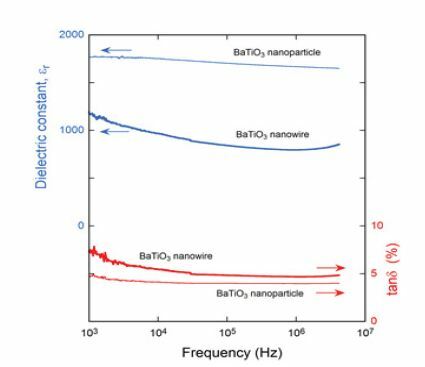 Thus, even with some intrinsic degradation arising from Al(OH)3 impurity, we expect that additional factors may compensate and/or enhance the dielectric response for BaTiO3 nanowires. Since the diameter of nanowires can be tuned by changing the AAO templates, much higher dielectric properties may be obtained by using the particle size effect . Such studies are underway. We have synthesized BaTiO3 nanowires via vacuum-and-drop method using AAO templates. Bundles of BaTiO3 nanowires with the diameter of ~200 nm were successfully obtained. The sample calcined at 700 ˚C for 2 h with NaOH post-treatment at 40 ˚C for 72 h was substantially composed of BaTiO3. Preliminary dielectric measurement for the sample calcined at 800 ˚C, even with some Al(OH)3 impurity, has suggested the future possibility of BaTiO3 nanowires as high performance materials. More efforts to obtain well-defined pure BaTiO3 nanowires and to evaluate them are on-going. This work was supported by Grant-in-Aid for Challenging Exploratory Research (No. 23655197). The authors thank Dr. Tohru S. Suzuki for the use of SEM. We also appreciate Sakai Chemical Ind. Co. Ltd for the supply of BaTiO3 reference nanopowder. 1 Hoshina T (2013) Size effect of barium titanate: fine particles and ceramics. J Ceram Soc Jpn 121: 156-61. 2 Frey MH, Payne DA (1996) Grain-size effect on structure and phase transformations for barium titanate. Phys Rev B Condens Matter 54: 3158-68. 3 Zhao Z, Buscaglia V, Viviani M, Buscaglia MT, Mitoseriu L, et al. (2004) Grain-size effects on the ferroelectric behavior of dense nanocrystalline BaTiO3 ceramics. Phys Rev B 70: 024107. 4 Wada N, Tanaka H, Hamaji Y, Sakabe Y (1996) Microstructures and dielectric properties of fine-grained BaTiO3 ceramics. Jpn J Appl Phys 35: 5141-44. 5 Rørvik PM, Grande T, Einarsrud MA (2011) One-dimensional nanostructures of ferroelectric perovskites. Adv Mater 23: 4007-34. 6 Fu C, Cai W, Zhou L, Chen H, Liu Z (2009) Synthesis of self-assembly BaTiO3 nanowire by sol-gel and microwave method. Appl Surf Scie 255: 9444-6. 7 Wang Z, Suryavanshi, Abhijit P, Yu, Min Feng (2006) Ferroelectric and piezoelectric behaviors of individual single crystalline BaTiO3 nanowire under direct axial electric biasing. Appl Phys Lett 89: 082903. 8 Alexe M, Hesse D, Schmidt V, Senz S, Fan HJ, et al. (2006) Ferroelectric nanotubes fabricated using nanowires as positive templates. Appl Phys Lett 89: 172907. 9 Yang Y, Wang X, Zhong C, Sun C, Li L (2008) Ferroelectric PbTiO3 nanotube arrays synthesized by hydrothermal method. Appl Phys Lett 92: 122907. 10 Suzuki Y, Yoshikawa S (2004) Synthesis and thermal analysis of TiO2-derived nanotubes prepared by hydrothermal method. J Mater Res 19: 982-5. 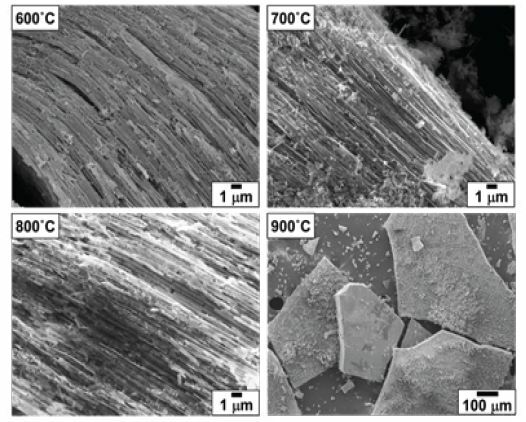 11 Suzuki Y, Pavasupree S, Yoshikawa S (2005) Natural rutile-derived titanate nanofibers prepared by direct hydrothermal processing. J Mater Res 20: 1063-70. 12 Stępniowski WJ, Cieślak G, Norek M, Karczewski K, Michalska-Domańska M, et al. (2013) Nanoporous alumina formed by self-organized two-step anodization of Ni3Al intermetallic alloy in citric acid. Appl Surf Sci 264: 605-10. 13 Aisu K, Suzuki TS, Nakamura E, Abe H, Suzuki Y (2013) AAO-template assisted synthesis and size control of one-dimensional TiO2 nanomaterials. J Ceram Soc Jpn 121: 915-18. 14 Hernandez Sanchez BA, Chang KS, Scancella MT, Burris JL, Kohli S, et al. (2005) Examination of size-induced ferroelectric phase transitions in template synthesized PbTiO3 nanotubes and nanofibers. Chem Mater 17: 5909-19. 15 Chen YY, Yu BY, Wang JH, Cochran RE, Shyue JJ (2009) Template-based fabrication of SrTiO3 and BaTiO3 Nanotubes. Inorg Chem 48: 681-6. 16 Žagar K, Rečnik A, Šturm S, Gajović A, Čeh M (2011) Structural and chemical characterization of BaTiO3 nanorods. Mater Res Bull 46: 366-71. 17 Shingubara S (2003) Fabrication of nanomaterials using porous alumina templates. J Nanoparticle Res 5: 17-30. 18 Sulka GD, Zaraska L, Stępniowski WJ (2011) Encyclopedia of Nanoscience and Nanotechnology: Anodic porous alumina as a template for nanofabrication. American Scientific Publishers 11: 261-349. 19 Vijatović MM, Bobić JD, Stojanović BD (2008) History and challenge of barium titanate: Part II. Sci Sinter 40: 235-44. 20 Leontsev SO, Eitel RE (2010) Progress in engineering high strain lead-free piezoelectric ceramics. Sci Tech Adv Mater 11: 044302. 21 Li BW, Osada M, Ozawa TC, Ma R, Akatsuka K, et al. (2009) Solution-based Fabrication of Perovskite Nanosheet Films and their Dielectric Properties. Jpn J Appl Phys 48: 09KA15. 22 Ogawa D, Akatsuka K, Fukumura T, Osada M, Sasaki T, et al. (2014) Fabrication and properties of microcapacitors with a one-nanometer-thick single Ti0.87O2 nanosheet. Chem Lett 43: 307-9. Figure 1: Schematic illustration of vacuum-and-drop loading method (VDLM). Reproduced with permission from . Copyright 2013, The Ceramic Society of Japan. Figure 4: EDS spectra of the samples calcined at 600-800 ˚C with NaOH post-treatment at 40 ˚C for 72 h. Au peaks are from surface coating. The inserts almost correspond to the analyzed areas. Figure 5: The dielectric properties of the sample calcined at 800 ˚C with NaOH post-treatment, viz., BaTiO3 nanowire (+ Al(OH)3 "composite"). Reference sample was commercial BaTiO3 nanoparticles.